Cafeteria Culture (CafCu) is an environmental education organization working with youth to creatively ​achieve zero waste schools, plastic free waters, and climate smart communities. Our programs foster youth-led, solutions with interdisciplinary education, merging citizen science and civics with the arts and video production. Students in our programs, overwhelmingly from low-income communities of color, take on the roles of environmental leaders, advocates, and storytellers, providing an urgently needed voice to New York City's environmental movement. Founded in 2009 as Styrofoam Out of Schools, we catalyzed the complete elimination of polystyrene (or styrofoam) trays from all NYC schools, resulting in the diversion of more than half a billion styrene foam trays per year from landfills, incinerators and student meals in a total of the 11 largest US urban school districts. Our student-led Cafeteria Ranger program, a free online resource, has paved the way for achieving zero waste cafeterias and our new goal, to achieve totally plastic-free school lunches, is revving up! These polystyrene plastic foam trays were disproportionately used by low income children, who eat up to 3 meals per day for as many as 13 years with hot food served directly on the tray. NYC is the largest school district in the US (double the size of L.A.), servicing 1.1 million students with 80,000 teachers and thousands of additional personnel. Seventy-five percent of the 850,000 meals served per day are free or reduced. Within one year, collaborative efforts resulted in "Trayless Tuesdays" across all 1700 NYC public schools. That initiative alone resulted in the elimination of 100 million styrene foam trays from school lunches, incinerators and landfills with no additional cost to the City. Now called Cafeteria Culture (CafCu), our organization has built strategic coalitions, resulting in the 2013 decision to completely eliminate polystyrene foam trays from all NYC schools. As of the fall 2015, New York City's agreement to co-purchase compostable plates with the 10 other largest U.S. school districts, catalyzed by CafCu's unstoppable grassroots efforts, has driven down cost of a compostable plate and diverted an impressive 1/2 a billion polystyrene foam trays per year from landfills, incinerators and school lunches in schools across the US! 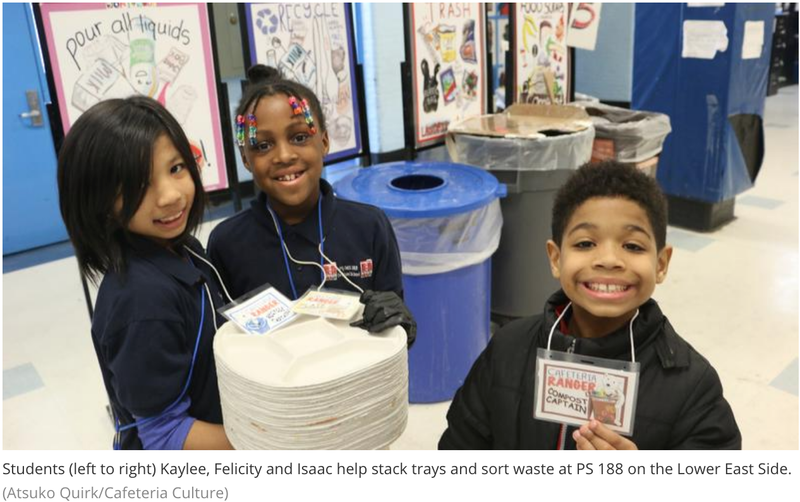 To ensure that the new compostable school food plates and other recyclables remain as resources, CafCu has taught our award winning “Cafeteria Ranger” service learning programs to over 9,000 pre-K- 12th graders in 22 New York City (NYC) schools. We start by teaching “Garbology 101,” connecting our garbage to environmental justice, climate change and marine plastic pollution. Then students take on leadership roles as Cafeteria Rangers during the lunch period to oversee all sorting. To scale the program up, CafCu launched a free online, multimedia SORT2save KIT in 2015. The “SORT2save Cheer” – video currently has almost 10K unique views on YouTube! Watch: "We are Citizen Scientists" on Vimeo ->; students from PS 15 Patrick F. Daly in Red Hook, Brooklyn take to the streets ti collect litter and data! Building upon the success of the Cafeteria Ranger programs, in 2015, Cafcu began to pilot Plastic Free Waters (PFW) curriculum, extending student leadership from the school out to the community. Students in grades 3-8 engage in the design of creative solutions to address one of the most urgent environmental and health issues of our time, the pervasiveness of single-use plastics in the environment. Students conduct street and beach litter characterization studies and cleanups, pilot reusable bag giveaways, engage neighbors and local businesses, and design creative messaging, such as giant puppets, banners and videos. Utilizing their own local data and culturally rich narratives, students present to their community, legislators, and government agencies, accelerating community and citywide action. Students in our programs have testified to NYC Council at a Wastewater Treatment hearing and recently presented to 70 attendees of a Plastic Free Waters Partnership meeting at the US EPA Region 2, to NGO leaders from China via a US State department invitation. The process builds student confidence and a sense of connection by rooting civics, leadership, and participatory democracy into place-based education. Programs are documented and promoted on CafCu’s YouTube channel, Cafcu Media - with over 28K subscribers and 21 million views - to inspire other communities to replicate similar initiatives. (watch: “Got Reusable Bags? Youth kickstart BYO bag movement in Flatbush”). In 2015, CafCu was one of only five North American organizations to receive an inaugural UL Innovative Education Award for advancing environmental STEM education, sustainable communities, and youth empowerment for our ARTS+ACTION school program (awarded via North American Association of Environmental Education). ​CafCu received an Environmental Quality Award from the US Environmental Protection Agency (EPA) Region 2 in 2013 and a competitive US EPA grant in for piloting Trash Free Waters interdisciplinary education in 2016-2017. Parallel to the Ranger program is our interdisciplinary "Make Change Messaging" curriculum. Lessons align with Core Curriculum and culminate in student designed campaigns, such as building giant puppets or creating PSA-like videos, to engage entire communities on the linked issues of garbage, environmental injustice, and climate change. We will soon be sharing this program with all NYC schools via our online multimedia Toolkit. Our Cafcu team has spent thousands of hours working closely with students and school staff in cafeterias in East Harlem, Crown Heights, East Flatbush, the Bronx and the Lower East Side, fueling us with invaluable "user" knowledge that we could not have acquired in any other manner. We regularly share valuable on-the-ground information and recommendations regarding packaging, messaging, product and system design with the directors of government agencies, helping to accelerate urgently needed change.